China has a history that spans thousands of years, and there is perhaps no better testament to its long and varied past than its temples. These sacred and peaceful havens are the perfect display of China’s diverse religious influences—Buddhist, Confucianist, Taoist, and sometimes a combination of all three!—as well as its distinct architectural style. From traditional Tibetan retreats to ancient imperial sites, China’s temples are truly unique and unlike anything you’ll see anywhere else. With a temple, or several, in almost every city, ranking them seems a near-impossible feat, but we’ve done our best to narrow them down to some of our favorites. One of the capital’s best-known landmarks, the Temple of Heaven is an architectural marvel with a colorful, centuries-long history. First built in the early 15th century by the Yongle Emperor (who oversaw the construction of another famous site, the Forbidden City), this temple was once the destination of an annual pilgrimage by the emperor, who would pray and offer sacrifices to the gods to help ensure a good harvest. Actually a complex of temple buildings strewn across a park that covers almost 300 hectares, the Temple of Heaven’s many structures underwent extensive damage during the Opium Wars in the late 19th century, but they have since been restored to their former glory. The unique round structure of the main temple sets this site apart from its other counterparts across China, making this unique landmark rife with cultural significance a must-see for visitors to Beijing. Former capital of the Southern Song Dynasty from the year 1127 to 1279, the city of Hangzhou is home to a number of historically important structures, all set in an area of great natural beauty. The hills surrounding Hangzhou and its famous West Lake are scattered with temples, the most renowned of which is Lingyin Temple, literally Temple of the Soul's Retreat. First founded in the 4th century, Lingyin Temple boasts a varied history, and despite being rebuilt more than a dozen times, it is now one of the largest and most successful Buddhist temples in all of China. In addition to its impressive architecture, Lingyin Temple’s main draw are the nearby Feilai Feng grottoes, a network of verdant caves that house stunning and beautifully preserved Buddhist rock carvings that date back over a thousand years. Martial arts aficionados may recognize the name of this temple, as it is the birthplace of one of the oldest and most famous styles of kung fu. Not far from the historic city of Luoyang, this original temple of the Shaolin school of Buddhism is where Shaolin kung fu originated hundreds of years ago. Shaolin Temple’s first resident monks, from as far back as the 6th century, were respected martial artists and soldiers, and kung fu continues to be practiced here. This history alone makes the temple worth a visit, not to mention its impressive traditional architecture. Shaolin Temple is also home to the UNESCO-certified Pagoda Forest, a collection of over 200 stone and brick pagodas that serve as tombs. These numerous pagodas, some of which are more than a thousand years old, are a stunning sight and render Shaolin Temple an even more fascinating location. First established during the Qin dynasty (221 to 206 BC), the area surrounding the northern city of Datong is full of historical sites and artifacts, the most notable of which is one of the world’s most peculiar temples. As its name suggests, the Hengshan Hanging Temple, or Xuankong Si, is precariously affixed to the side of a sheer cliff 75 meters off the ground. First built 1,500 years ago, this architectural masterpiece has withstood the test of time, and its seemingly treacherous position earned it a spot on Time’s list of the 10 most precarious buildings in the world. The Hanging Temple’s position is not the only notable thing about this temple, however. 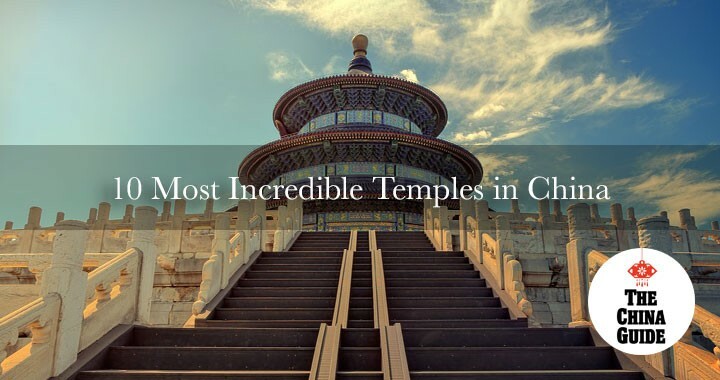 It is also the only temple on the planet where all three of China’s most prominent religions are practiced, combining Buddhism, Taoism, and Confucianism into a fascinating cultural amalgam that is all its own. This combination of factors makes the Hanging Temple one of China’s most interesting religious and historic sites, and by far one of our favorite temples in the Middle Kingdom! While most visitors are attracted by its white-sand beaches and turquoise waters that seem to have come straight out of the Caribbean, the island province of Hainan is also home to a vibrant culture. One of the best illustrations of that is its magnificent Nanshan Temple, the centerpiece of which is a bronze statue of Guan Yin Buddha that stands at 108 meters in height, outsizing even the Statue of Liberty! Built in 1988 to commemorate Buddhism’s 2,000-year influence in China, Nanshan Temple beautifully captures China’s long religious background. The temple is made even more charming by the heavenly sub-tropical setting of Hainan, and has become a popular tourist destination since its construction. While not the oldest of temples by Chinese standards, the seaside Nanshan Temple and its incredible, one-of-a-kind Buddha statue make for an impressive sight. Visitors to Tibet usually come for two main reasons: to admire stunning alpine scenery and to soak in the mystical atmosphere of Tibet’s religious sites. Jokhang Temple, in the city of Lhasa, is the heart of Tibetan Buddhism and is considered the most sacred and important temple in the entire region. Worshippers from all over Tibet flock here, and being home to dozens of monks, it is the perfect place to get a truly authentic sense of Tibetan Buddhist practice. In addition to its religious significance, Jokhang Temple boasts a fascinating history that dates back to the year 652, when it was built to house Buddhist statues brought as dowries by the then-king’s two brides. A combination of traditional Tibetan, Nepalese, and Indian design, the temple is a site of great architectural interest as well, making it a must-visit attraction for any traveler to Tibet. History buffs should not skip a visit to this unique temple, as it is said to be the oldest Buddhist temple in all of China. Established as early as 68 AD, White Horse Temple near Luoyang boasts a very long and storied history that is unparalleled among Chinese temples. The number of colorful legends and tales surrounding this temple are astounding and truly give you a sense of its importance as a site of religious learning and worship throughout history. Today, the temple is made up of various halls that are full of ancient statues, including a famous jade statue of Sakyamuni Buddha. White Horse Temple also houses beautifully manicured gardens, which truly come alive every April during Luoyang’s annual Peony Festival. Beijing’s Lama Temple, also known as Yonghe Temple, is a magnificent structure in a bustling neighborhood in one of the world’s biggest cities, and has come to be known as the most famous Tibetan Buddhist temple outside of Tibet. First built as an imperial residence in 1694, the site was converted into a lamasery in 1722 and so it has remained ever since. An active monastery of the Tibetan Gelug sect, it is common to see monks in brightly colored robes and locals alike praying and burning incense, giving the temple a very authentic and peaceful atmosphere. The temple’s five grand halls house a number of beautiful statues, including an 18-meter statue of Maitreya Buddha that entered the Guinness Book of Records in 1993 as the world’s tallest statue made out of a single piece of wood. These religious relics, combined with its unique and magnificent architecture, make Lama Temple well worth a visit during your stay in Beijing. Perhaps no figure from Chinese history is better known than Confucius, and his teachings inspired a religious and philosophical tradition that has gone onto influence the very fabric of everyday life in China. There’s no better place to witness and appreciate the immense significance of Confucius’s legacy than his hometown of Qufu, a small city in the eastern province of Shandong. Fittingly, Qufu is home to the country’s largest and most important Confucian temple, which was established in honor of the famous sage not long after his death. Over the centuries, numerous emperors and other important figures have made pilgrimages to Qufu to venerate and offer sacrifices in honor of Confucius. Rebuilt and renovated extensively throughout its long history, today’s Temple of Confucius is among the largest of all temple complexes in China, consisting of nearly 500 different rooms spread across an area of 16,000 square meters. This temple, immense in both size and significance, is unmissable for those interested in the Confucian tradition. From the world-famous Terracotta Army to its centuries-old city wall, the city of Xi’an is full of ancient wonders, and its renowned Da Ci’en Temple is no exception. Home to the iconic, seven-storey Big Wild Goose Pagoda, Da Ci’en Temple is a Buddhist sanctuary that boasts a history spanning over a millennium and remarkable architecture, all set within a busy urban neighborhood. First established in 652, Da Ci’en Temple and the towering pagoda that has made it famous were constructed and managed by the legendary Buddhist monk and scholar Xuanzang, whose pilgrimage to India is immortalized in the novel Journey to the West. During his tenure as head of the temple, Xuanzang founded the East Asian Yogacara school of Buddhist thought, and Da Ci’en Temple remains the most sacred location for this tradition and its followers. The religious significance of this temple, combined with its majestic pagoda, make it one of Xi’an’s most famed sites.